A fun and interactive painting experience for corporate entertainment, parties for all ages and art workshops. 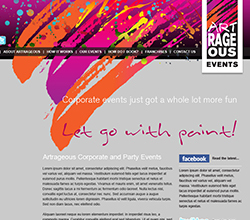 Artrageous Events wanted an exciting website design to reflect the fun and spontaneity of an Artrageous painting event. Tailored to the client's exact requirements, the events can be used for corporate entertainment, parties for all ages and art workshops. Social media integration was an important feature of the marketing strategy. A unique corporate identity and brand was developed that captured the essence of an Artrageous Event. Social media and many other features were integrated to support the marketing communicatios strategy.